I was checking through my list of Vartox appearances... and came to learn I was missing two of 'em! Not just any two, but the next two we were set to cover here! Would Vartox "Week" only last three days?! No, of course not... because I did what any idiot would do... and marched right into a couple of local shops and shouted "I need Vartox... and money's no object!" I was met with blank stares, and directions to the nearest pharmacy. When I finally smartened everybody up... I managed to find both the books we needed to keep this Festive Week of Vartox rollin'! You might say it's a Vartox Week Miracle (they exist, ya know)! We open with... our hero Vartox, returning back to his home planet of Valeron after a "grueling galactic patrol". We learn here that Valeron is part of the "Sombrero Hat Galaxy", which is just too fun not to mention. Upon arrival, he saves a girl's cat-beast from a tree... also, the PLANET EXPLODES. 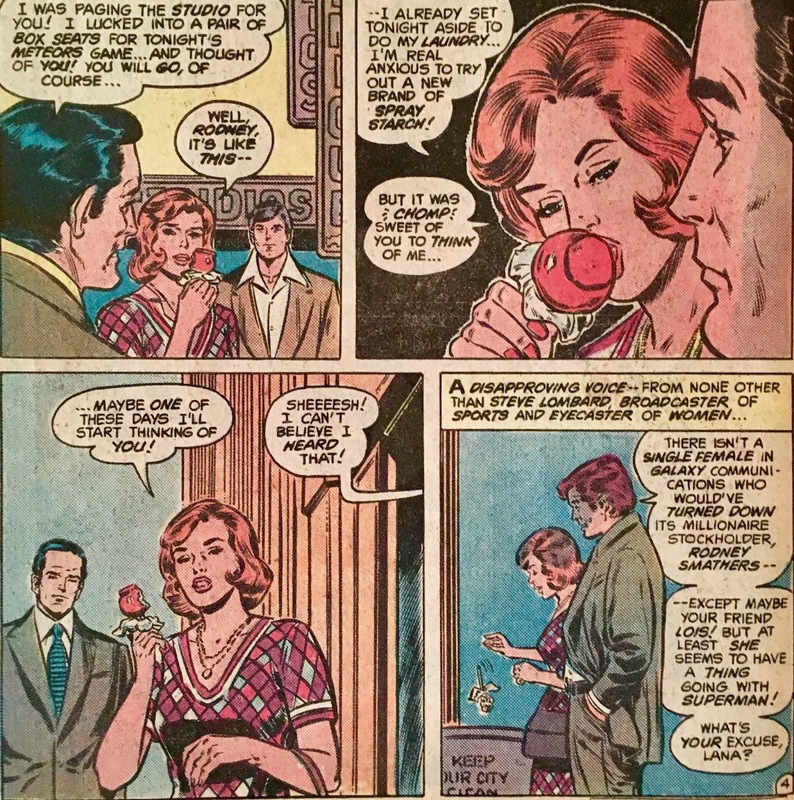 Onto more serious matters... on Earth, Lana Lang buys a candy apple. As she chomps away, she is approached and chatted up by the millionaire Rodney Mathers. She turns him down flat... claiming she'd rather do laundry than spend an evening with him. Steve Lombard overhears this, and cannot believe his ears. 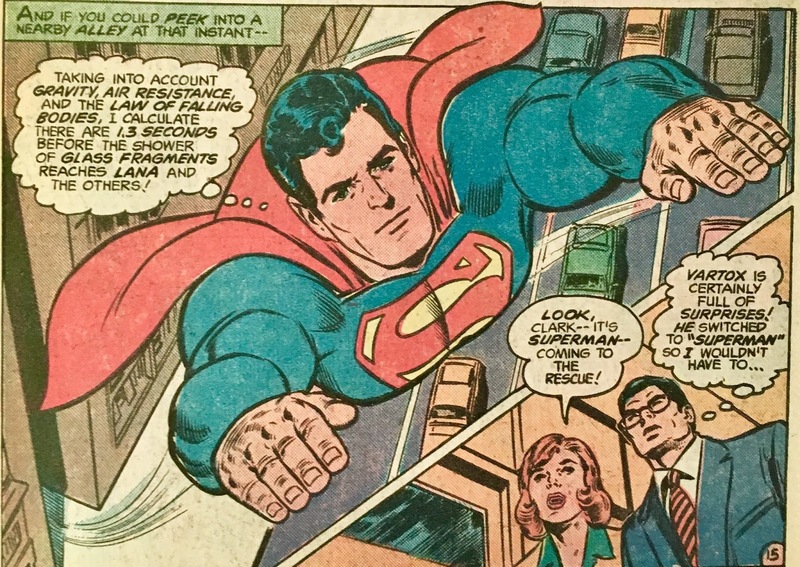 Speaking of not believing his ears, Clark Kent hears a feint, yet familiar sonic distress call. He ditches a yappin' Morgan Edge and makes a quick-change in an elevator. It's here he says "two seconds" is more than enough time to change clothes... which, begs the question why he needed the cover of a smoke stack that other time! 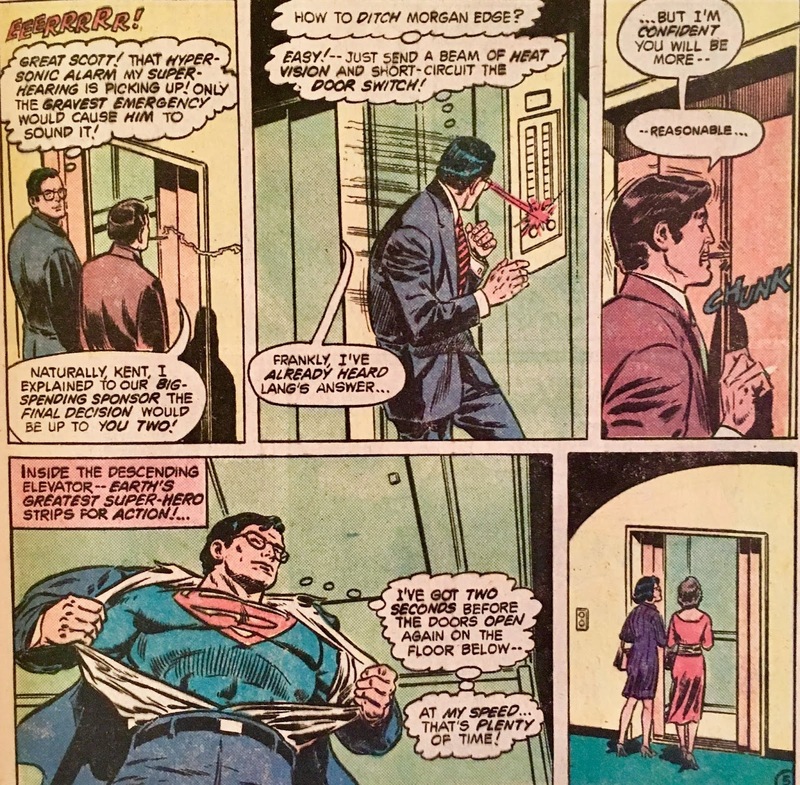 After "Suping up", Superman finds Vartox... standing on a dark cloud. I mean, literally... poor ol' Vart is standing on a black cloud. It'd be hilarious if it wasn't so pitiful! Anyhoo, he shares his tale of woe with the only other man in the universe he felt he could go to. 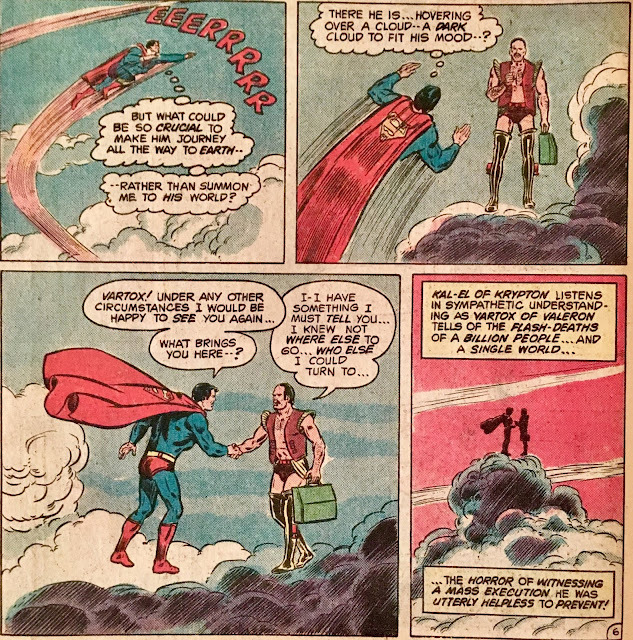 Superman takes him to the Fortress straight away, so they can attempt to plan for his future. Once in the Arctic, they see a weird craft... which Superman believes must have just crashed. Vartox corrects him, claiming that it had been there for centuries... and only became visible due to a shifting of the ice causing a glacial fissure. 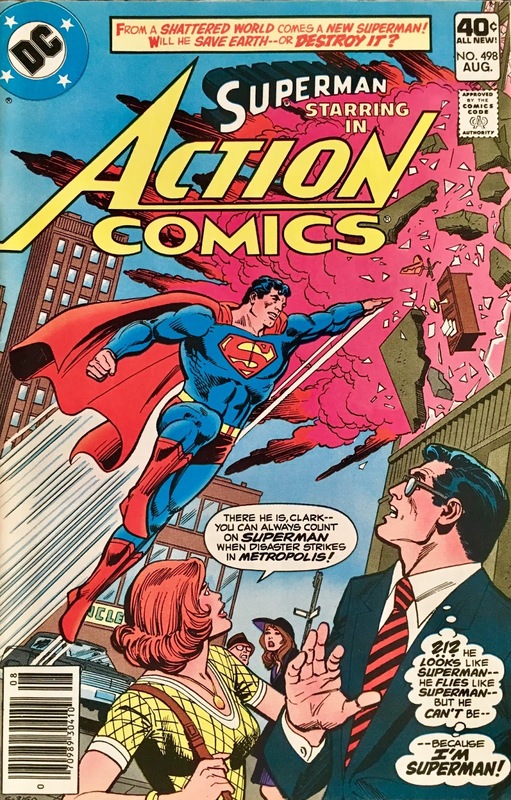 It is, naturally, lined with lead... so, Superman's outta luck. Vartox, however, has no such restrictions... actually, he doesn't seem to have any restrictions, so he takes a peek. What he finds inside are... well, all of the Valerons who perished in the explosion! He collapses with grief. 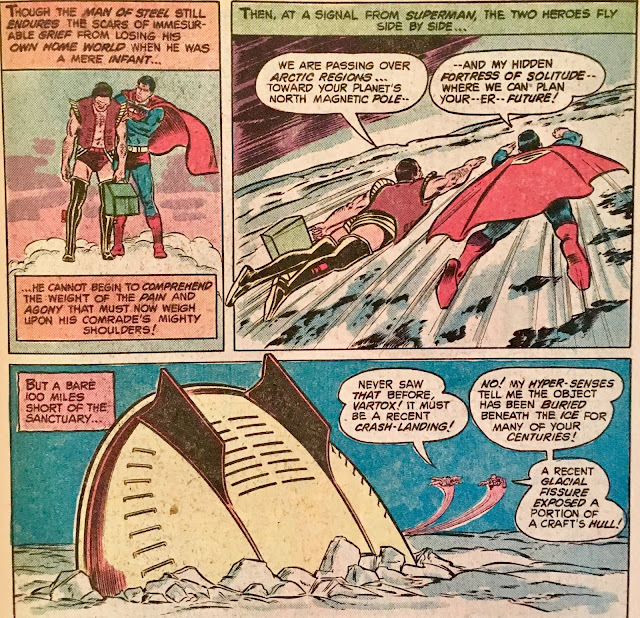 A beam is fired from the craft... which doesn't even tickle Superman. 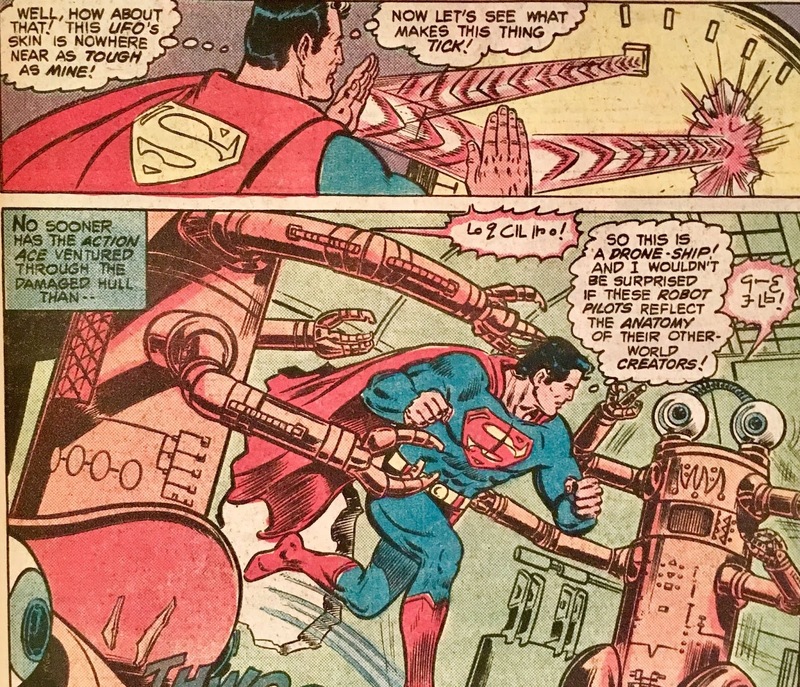 Using the power of, ahem "hand-to-hand-super-deflection", the Man of Steel ricochets the beam back at the ship... revealing it to actually be occupied by a pair of a-hole robots! 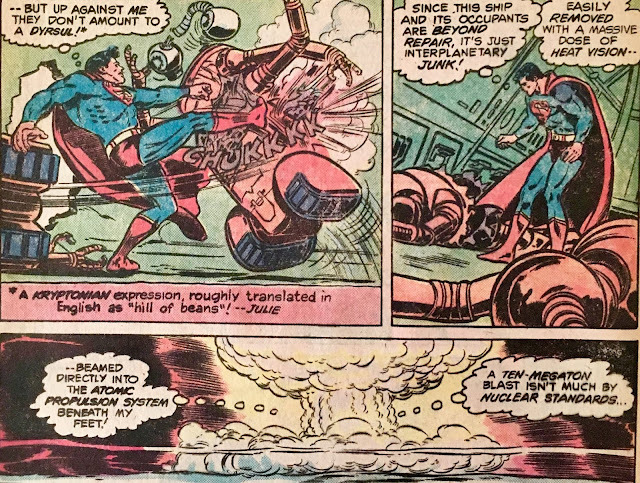 After a brief battle, Superman lights the sucker up... using his heat vision on the on-board "atomic propulsion system", he causes... a "small" nuclear explosion. He looks over to Vartox, and finds him hunched over and quivering. Fearing that his super-pal might've just lost his marbles, Superman approaches. Turns out, he was just protecting his little lunch-pail thingie. 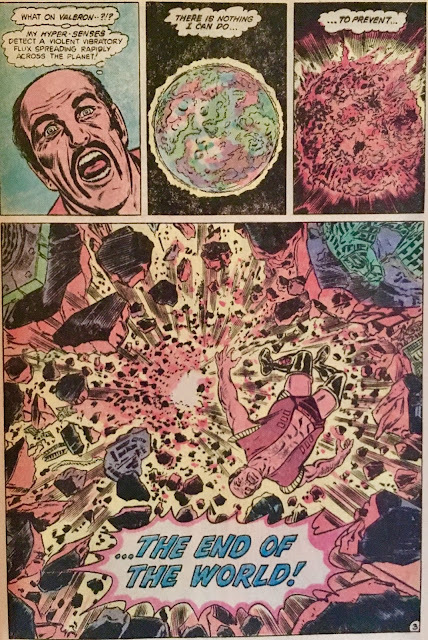 When they finally make it to the Fortress, Vartox reveals the contents of his case... it's some glowing rocks from Valeron... Valeronite, if you will... only not dangerous to anybody. He wishes to study the rocks to see if he can deduce why his planet went boom. 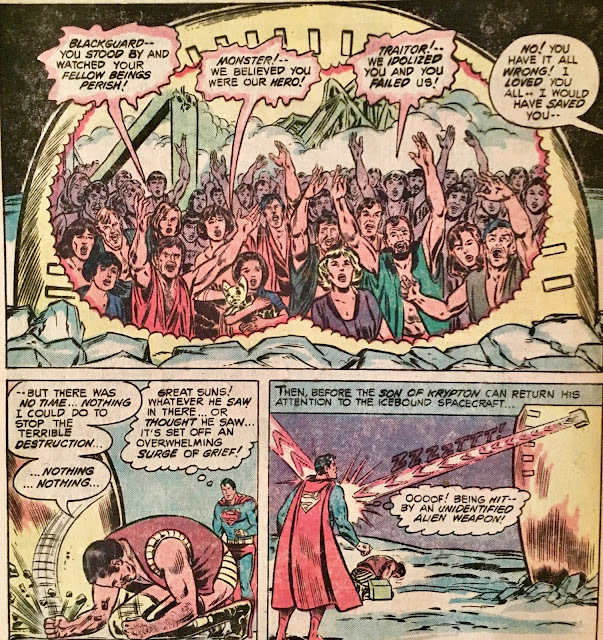 Superman gives the thumbs-up, and says Vartox has full access to all of the Fortress's Sciences's's's during the night... however, he's gotta spend his days... in Metropolis! Speaking of Metropolis... let's head back there! 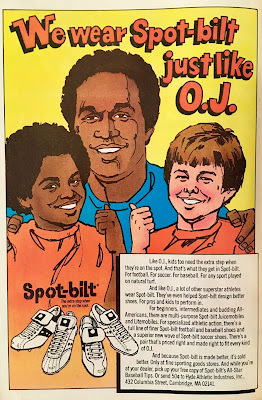 It's the next day, and Clark is in the commissary. 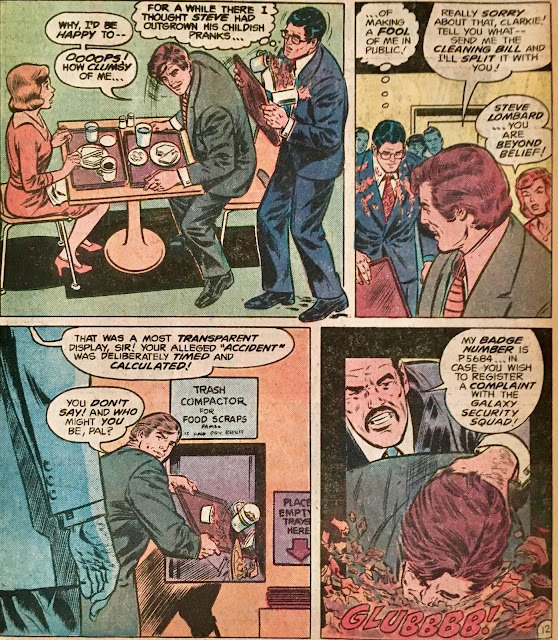 He goes to sit down across from Lana... however, Steve Lombard snatches his seat... and in doing so, actually spills Clark's lunch all over his (Clark's) suit. After eating, Lombard heads over to dump his scraps into the trash compactor... but runs afoul of the Galaxy Building's newest security guard! 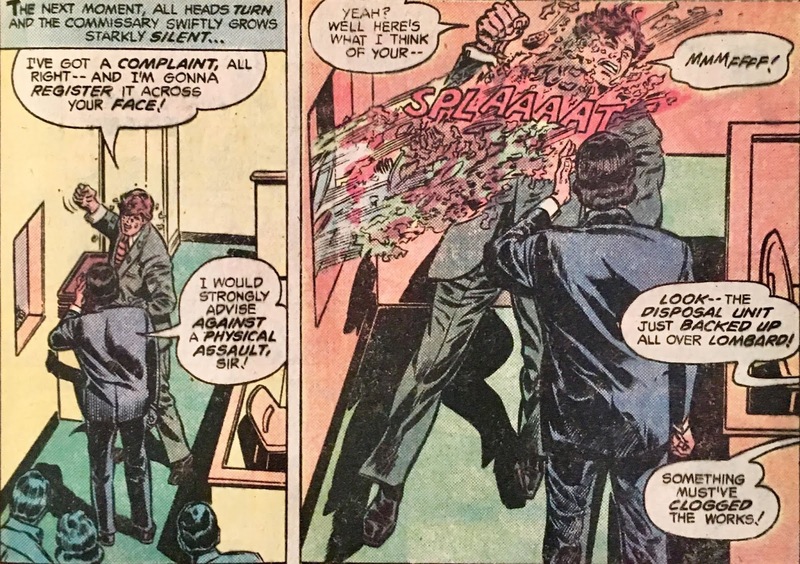 Then... as if being controlled by some unseen force... the trash compactor backs-up all over poor Mr. Lombard! This new security guard is... Vernon O'Valeron... you can call him "Vern"... or, ya know "Vart". 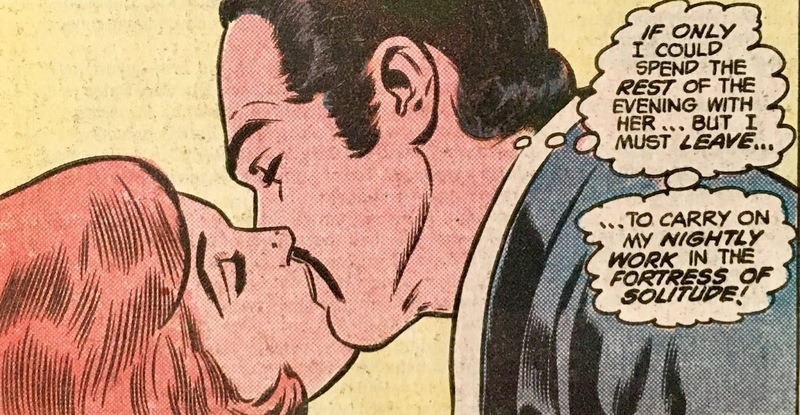 He and Lana appear to be drawn toward one another almost instantly. 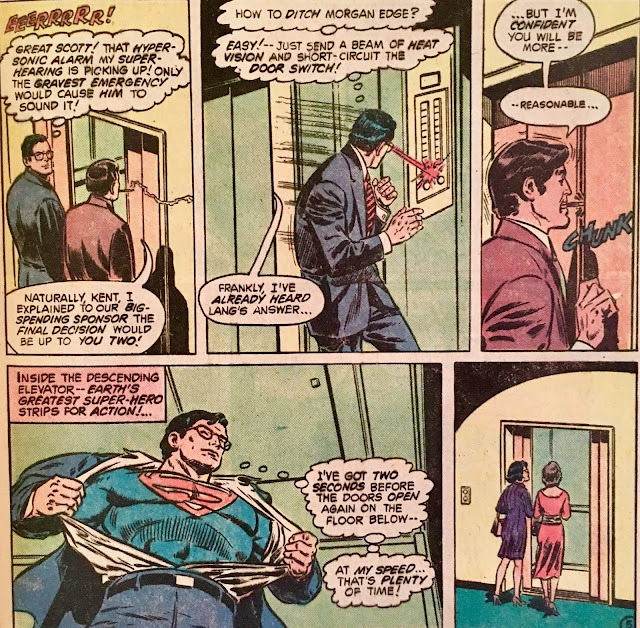 We learn that Clark has set "Vern" up with a temporary security gig while he figures out what to do with him. 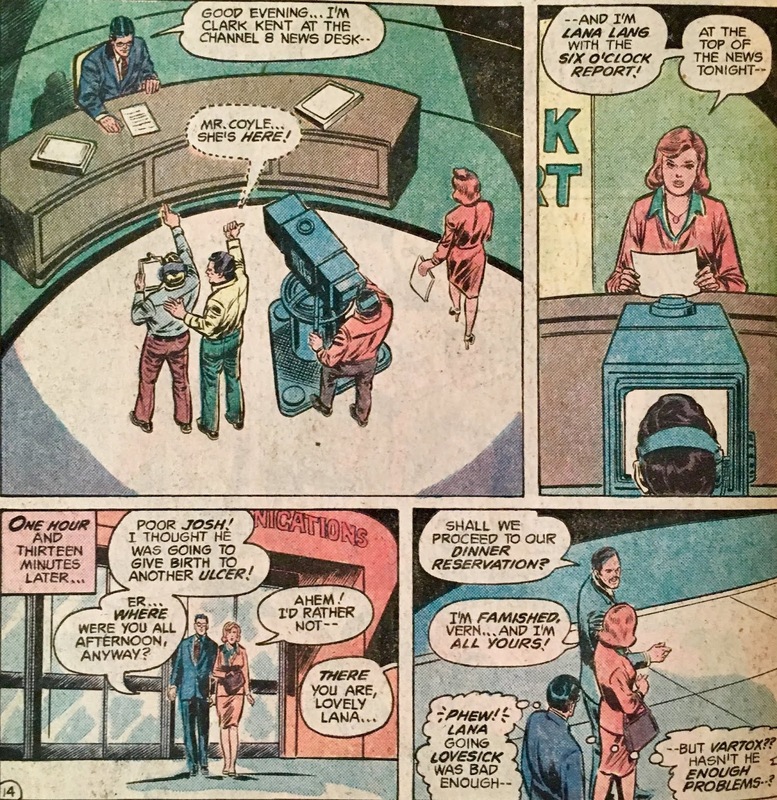 That evening, Lana Lang arrives on-set for the six o'clock news a bit late. Sounds like she's spent her afternoon in Vartoxville! After work, Lana and Clark head outside... where they're greeted by Vernon! Suddenly, the sixth floor of the Galaxy Building explodes into flames! While Lana and Clark look on... Superman shows up?! Clark watches... and thinks to himself that he could've saved the people on the street from the falling glass without even changing into costume... but, figures he might as well just enjoy the show. 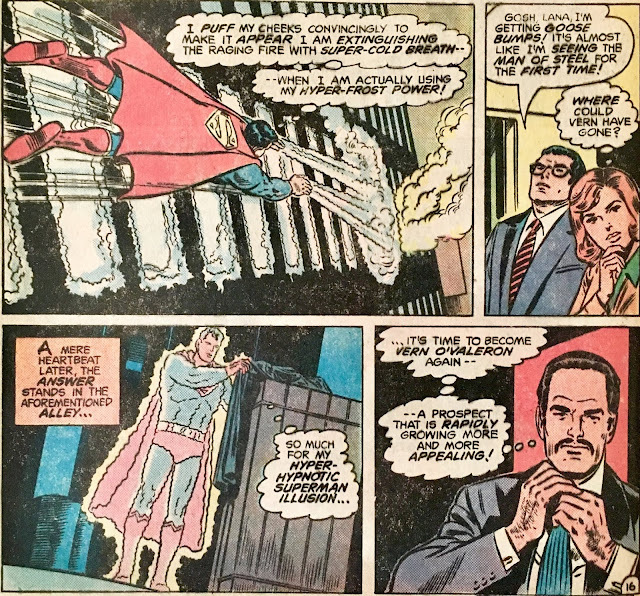 This "Superman" is, of course, Vartox... using a "Hyper-Hypnotic" Superman Illusion. 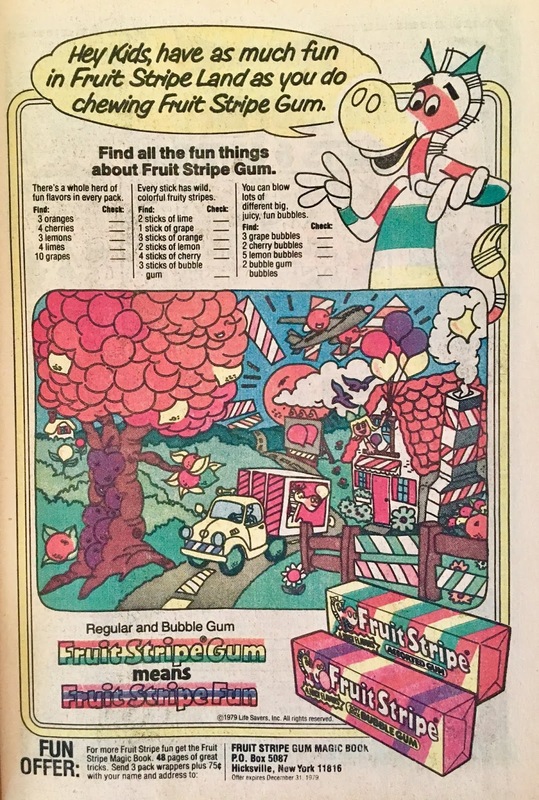 That's right, not just "hypnotic"... but "hyper-hypnotic". 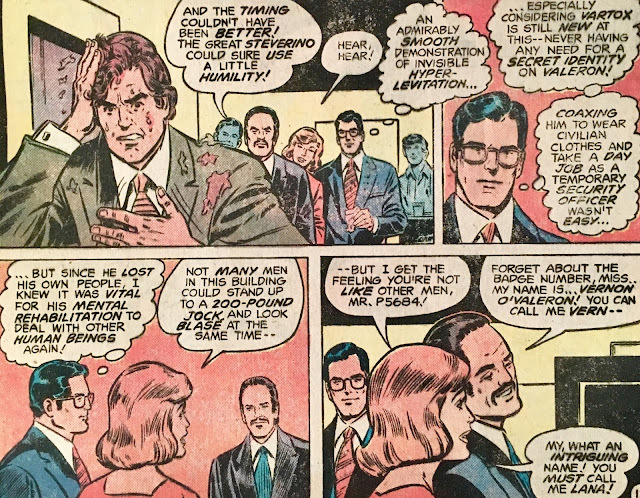 Vern returns to the scene, and explains his absence as having to attend to some security-type thing. He reports that the sixth floor was empty at the time of the blast... and nobody was injured. 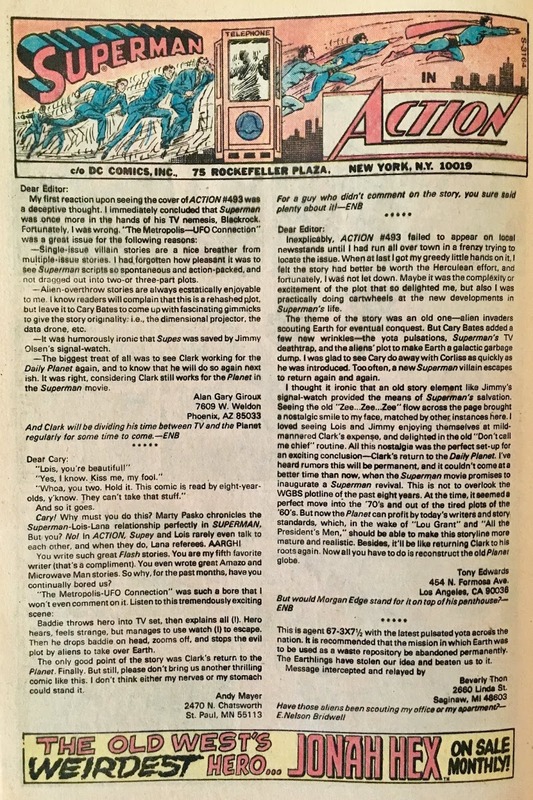 It's here that Clark realizes that he's become the "third wheel" and excuses himself... just before Lana and Vern kiss! 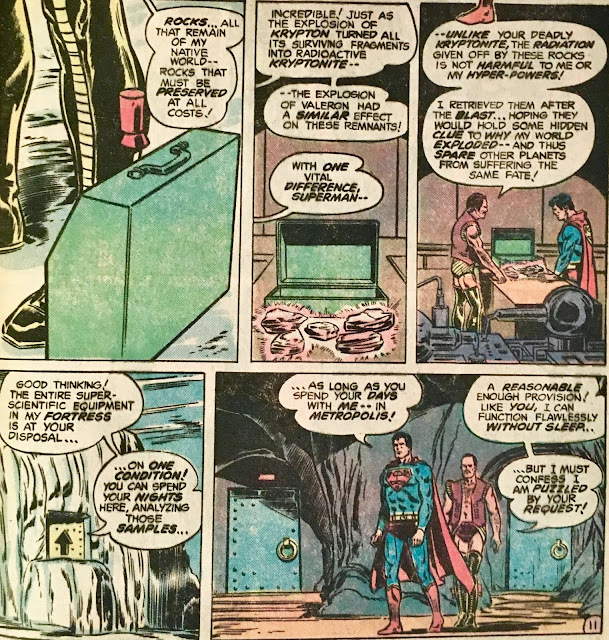 We wrap up later that night at the Fortress of Solitude... where Vartox has deduced that the reason for Valeron's demise was... him! What's more, by coming to Earth... he's doomed our planet as well! 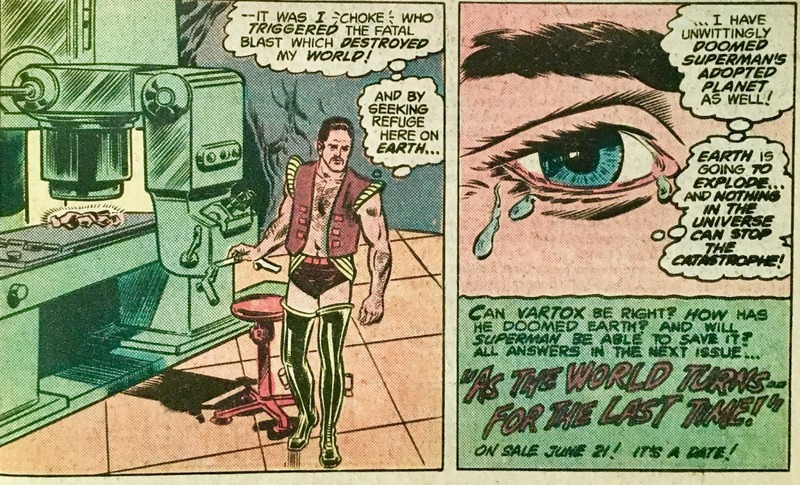 Holy cow, you guys... Vartox might be one of the most tragic characters in Superman... nay, all comics history. You almost want to give the poor guy a hug... if you weren't afraid of getting tangled-up in his chest-tuft. - It was his fault!!! You kidding me? I really thought our deep-dive into the Manliest Man Who Ever Manned would be much "lighter" than this! At this point, we might as well call him the Most Unfortunate Man Who Ever Unfortunated! I mean, just picture him standing on a dark cloud, carrying his cute li'l lunch pail... like he was a mustachioed second-grader who just missed the school bus... and it's raining out... and it's Monday. That aside, seeing Vartox-as-Vern was actually quite fun. 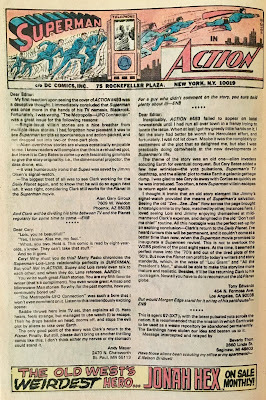 I like his weird adversarial relationship with Steve Lombard, which we've seen before here at the blog. Hell, I even dig the relationship with Lana. What really tickles me about it is, when Clark sees that they're getting close, he's actually worried for Vartox... and not Lana! This issue started off exceptionally strong... 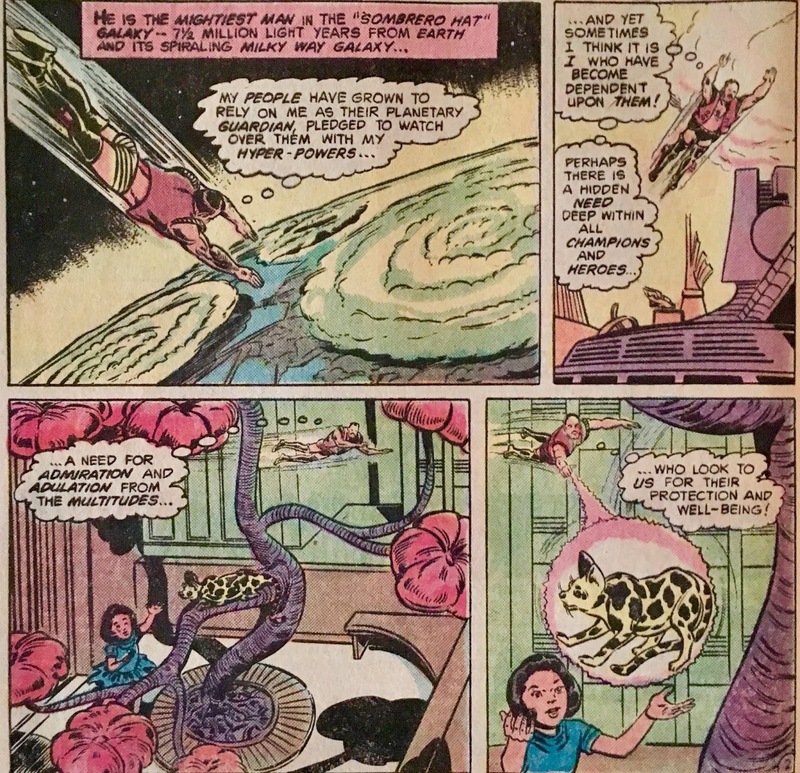 I mean, we go from a bright shiny day on Valeron, where the biggest problem is fetching a cat-beast out of a tree... to the planet exploding! I suppose I could've done without the a-hole robots... but, I mean, this is "Action" Comics... gotta have a little bit of... action. 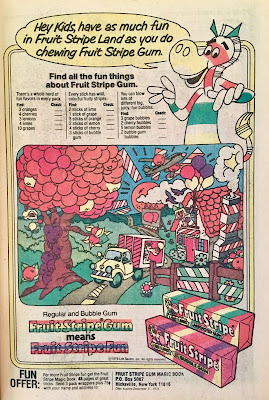 Overall... a fine issue. I'm really enjoying getting to know Vartox... and I hope you all are too! 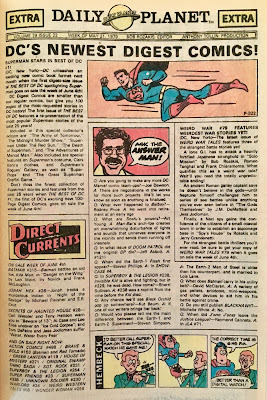 This is another issue that is not available digitally. 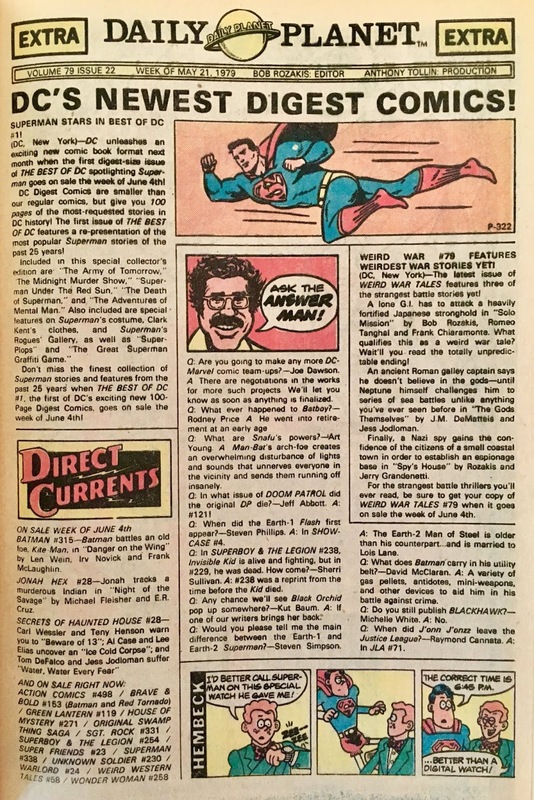 If only we had a bigger voice... how great would it be to get a Superman: Vartox trade collection? Anyhoo... worth picking up, if you come across it! Tomorrow we'll find out how the Manliest Man Who Ever Manned gets himself outta this one!